People spend 87 billion dollars worldwide on hair care a year. Did you know oil is the most amazing thing for your hair? If oil can get you the results you want without breaking the bank, you might as well try it. So you grab whatever oil you have in your cupboard and slather it on. You go to wash it, excited to see your amazing new hair…only to be disappointed. Your hair now looks dirty and weighed down. Those weren’t the results you were looking for. Even though oil is amazing — the problem was you didn’t choose the best hair oil for your hair type. Let’s look at which oil you should have used to get great results. Does your hair sport a constant frazzled look? If you have dry, frizzy locks you’re probably searching for ways to make your mane shiny and smooth. Hair oil is a fantastic way to do it. Argan oil is an excellent choice. This oil comes from the exotic land of Morocco so it has to be amazing, right? In fact, it’s so amazing that the Moroccans call it “liquid gold” and that’s not just because it’s gold in color. It’s also pretty unique because tree-climbing goats help to produce it. The nut of the argan tree is pretty hard to crack. Thus, folks starting rummaging around in the goats’ poop for partially digested ones that were easier to open. And argan oil made it big around the world. Argan oil comes with a healthy serving of fatty acids, vitamin E and antioxidants. These nutrients are perfect for thirsty hair and help tame those frizzy flyaways. Olive oil is another great option for super dry hair. This thick, moisturizing oil coats each strand of oil and helps provide protection against heat and other damaging elements. Be sure to use olive oil sparingly, though. It can weigh down your hair and make it look greasy if you use too much. A tablespoon or two once a week is all you need. Because olive oil coats the hairs and penetrates so well, it’s also a great oil to use for damaged hair. This action helps to hide the damaged hairs. 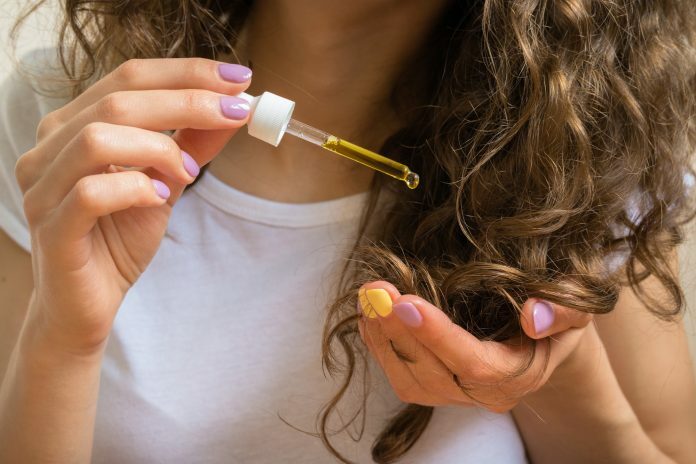 There’s no way to completely undo the damage that has been done to your hair, but olive oil can hide it while you wait for new hairs to grow in. Another fantastic oil to use for damaged hair is macadamia oil. If you need some intense help for your hair, this is the oil to try. You can use it once weekly to replenish very dry hair. It’s also great to counteract the effects of high heat styling sessions. It may sound a little counterintuitive to put oil on oily hair. You do have to be careful, a thick oil like olive oil can weigh down your hair very easily. But the right oil can help hydrate your hair and help keep your body from overproducing your natural oils. Coconut oil is a great choice for oily hair and virtually all hair types. It is one of the most versatile oils you can use for hair. If you have oily hair, simply don’t apply it to the scalp to avoid having greasy dirty-looking hair. Your hair type should be one of your primary considerations when choosing a hair oil. But the right oil can also help with a host of other hair issues. Let’s take a look at a few. Do you struggle with dandruff? Nobody likes those unsightly specks of skin showing up in their hair and on their clothing. The right oil could be just what you need. Jojoba oil is a fantastic oil that is actually very chemically similar to the natural oil produced by the body. It works very well to penetrate and hydrate each hair. It is a light oil you can use on your scalp and throughout your hair to help with both dry scalp and dandruff issues. Castor oil has a special kick that makes it very effective against dandruff. The oil contains anti-fungal properties that address the problem at the root. This oil is quick thick, however, so it may be best to mix it in with a lighter carrier oil like coconut. For best results, try using one of these oils after washing your hair with tea tree shampoo. This helps to properly nourish the hair while attacking the dandruff problem at its root, rather than simply treating the symptoms. Do you suffer from a skin condition like psoriasis or dermatitis, or does your skin tend to break out or have other reactions to beauty products? As natural products, it’s unlikely that you’ll have a strong reaction to any of these oils. But if you’re concerned, try Kalahari melon seed oil. This oil is well-known for being very gentle on the skin. It also has excellent reparative qualities for your hair. You can enjoy shinier, healthier hair without wondering if you’ll have a reaction to the product you use. Looking for longer locks? The right oil can help with that too. Baobab oil is packed with a delightfully nutritious cocktail of vitamins A, D, E, and F. These give your hair the nutrition it needs to grow and regenerate cells. Thus, it can help speed the growth of your hair overall. As you can see there are a variety of oils that you can use on your hair. The best hair oil for you will depend on the type of hair you have, plus any problems you wish to target. Now, armed with this knowledge, you can try experimenting with the right oils for your hair. Be sure to let us know in the comments how it turns out. As always, for more great hair health tips be sure to check out our blog.